A new study shows that crash rates are up six percent in the four states where cannabis is legal, compared to neighboring states. Which is a good reminder that it can take a full 24 hours or more to metabolize marijuana. And driving under the influence of cannabis is just as illegal as alcohol, if harder to quantify. Meanwhile, Wednesday marked the first day cannabis was legal in Canada. And it only took one hour before the first ticket was issued for toking behind the wheel. Photo by Michael Fisher from Pexels.com. A 25-year old driver got life behind bars for intentionally ramming an LAPD patrol car and killing the officer inside, in an attempt to help his friend in another car escape a police chase. Which couldn’t be more deserved. But remember that the next time a driver gets a slap on the wrist for deliberately running down someone on a bicycle. And combining the last two themes, Jeffrey Fylling forwards a press release from the Orange County DA’s office announcing that a 24-year old woman will face up to 10 years in prison for killing an 81-year old man while allegedly driving high on cannabis. Which gives a whole new meaning to the term weed killer. 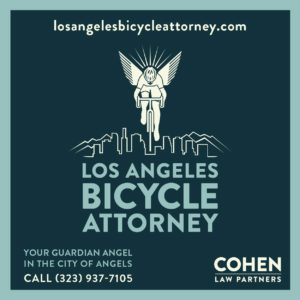 It would be nice to see prosecutors take it that seriously the next time a California driver kills someone on foot or on a bicycle. CD6 Councilmember Nury Martinez is asking for your input in designing a Safe Routes to School program to improve walking and bicycling to Van Nuys Elementary and Panorama City Elementary schools. A public meeting will be held at each school next Thursday to discuss a Walking Safety Assessment. Curbed talks with East Side Rider’s founder John Jones III about the club’s efforts to inspire change in the local South LA community through bicycling. Although I had no idea they had chapters in other cities across the US. And thanks to whoever sent this to me; my apologies for losing track of it. CiclaValley previews Monday’s Donut Ride on Reseda Blvd. Forget the candy this Halloween. Metro Bike is offering a bulk discount on single ride bikeshare passes. Although that doesn’t guarantee you won’t get egged or TPed by kids who’d rather have a sugar high than a free ride. Helen’s Cycles is hiring a part-time cashier for their Santa Monica store. Over 1,000 bicyclists are expected to turn out for the annual Tour of Upland next month. About 40 veterans and first responders are making their way down the California coast as part of the eleventh annual Project Hero United Healthcare California Coastal Challenge to highlight the health issues they face, including PTSD. Chico is updating its bike plan after just five years. So naturally, the local TV station quotes a driver complaining about scofflaw bicyclists. I wonder if they also bring up lawbreaking drivers whenever someone wants to build a new overpass. They get it. AARP suggests ten ways bicycle friendly streets are good for people who don’t ride bikes, while offering a reminder that people of all ages like to ride bicycles. Print this one out before your next public meeting, and leave a copy on every seat. Especially since older people tend to be more resistant to bike-friendly changes. A writer for a travel site says you can participate in adventure travel, even with a hidden disability. Forbes suggests what you can do in your own neighborhood to slow climate change. Hint: It has pedals and two wheels, and maybe a battery. Motherboard says e-scooters reveal America’s urban transportation crisis, adding they’re fun, but nobody knows what to do with them yet. Portland experiments with raised, floating bus platforms to reduce crashes with bike riders. For once, Los Angeles got there first with raised platforms on Los Angeles and Figueroa. Nebraska tourism officials are told they can bicycle their way to prosperity by hitching a ride on the bike tourism boom. No bias here. A Chicago writer complains about an “abundance of rude (maybe even psychotic) bicyclists” who ride on the sidewalk, instead of in the “bike lanes that have disrupted and uglified” downtown streets, while adding that police should ticket downtown bike riders instead of sidewalk riders in black neighborhoods. Nothing opposing bike lanes, as well as people who don’t feel safe using them. Chicago’s Bike Lane Uprising is a crowdsourced civic tech platform designed to make it easier to report drivers blocking bike lanes or other obstructions. St. Paul MN discovers they can trick drivers into stopping for pedestrians in crosswalks. New Orleans bike riders will no longer face a $150 fine for failing to failing to register their bikes; the city revoked its mandatory registration after one rider received nearly $1,000 in tickets for a single traffic stop, including one for failing to register his bike. The police chief in Tampa FL says his cops stop bike riders mostly because they don’t have lights, run stop signs or ride salmon. It’s just a total coincidence that 80% of the bike riders they stop are black. A Tampa TV station says a three-foot wide curb bike lane is dangerous by design, putting bicyclists too close to passing cars. Especially since that three feet appears to include the gutter. Treehugger says it’s time to face the dangers cement trucks pose to the people around them, and put safer trucks on the roads. Road.cc lists 18 things they “reckon” every bike rider hates. I hate the word reckon, but I reckon that’s my problem. A new urban bike promises to be weatherproof and maintenance-free, with airless, puncture-proof tires, a carbon belt drive, and seven speed internal hub. Although the nearly $2,000 price tag could put a dent in your wallet. Your next bike helmet could be printed, not made. Drivers in the UK could be required to give bicyclists and pedestrians the right-of-way in every situation under a proposed revision to the country’s Highway Code. A trio of bighearted British kids raised the equivalent of over $6,500 for a hospice for terminally-ill children and adults; two rode 300 miles across England, while the third, who suffers from Cardio Facio Cutaneous Syndrome, rode 30 miles on his adaptive bike. It’s official. Scottish cyclist Jenny Graham has shattered the women’s record for bicycling around the world in just 124 days, beating the existing record by 20 days. France considers a mandatory bicycle registration program to fight bike theft as part of a 25-point, $401 million plan to boost bicycling — including a proposal to pay people up to $458 a year to bike to work. Volkswagen’s new smart headlights promise to recognize and highlight people walking or riding bikes in low light. Which the drivers probably won’t notice because they’ll be too busy with their phones. An Israeli soccer player is expected to be charged with hit-and-run and DUI for a crash that killed a teenage boy illegally sharing a friend’s ebike; the other boy could also face charges for carrying a passenger, swerving into the driver’s path and riding without a helmet. A legendary Aussie firefighter wants to thank the stranger who tossed his bicycle in the back of his SUV and drove him home after he took a bad fall in traffic, injuring his shoulder. A Manilla legislator proposes a nearly five-foot passing distance to improve safety for people on bicycles. VeloNews looks at the complicated case of newly crowned women’s masters champ Dr. Rachel McKinnon, saying the debate over the first transgender world champ can’t be solved, but it can be better understood. Former Tour de France winner Sir Bradley Wiggins says like it or not, Lance is iconic, and was singled out for doping when he wasn’t the only one doing it. Surprisingly, the winner of last year’s Zwift indoor cycling competition has thrived in the pro peloton, signing with pro team Canyon-SRAM for a second season. When you really want to go retro with your water bottle. If you don’t think drivers hear your warnings, get a grip. And when your marriage goes downhill as soon as you say your vows. Danger d reports that LA Councilmember Nury Martinez’ office has come through on their promise to do something about drivers parking on the bike path through Balboa Park. He says it may just be a temporary fix, but it will do until they can come up with a more permanent solution. 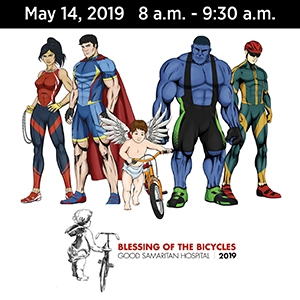 Here’s a chance to help others while you get rid of any old, unused bikes you have sitting around. 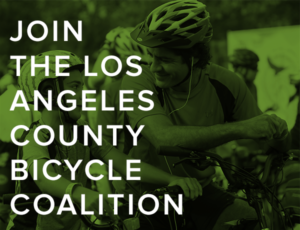 You can drop your bikes off at 5619 Monte Vista St in Los Angeles, or call 323/255-6806 for more information. Burbank-based Pure Cycles is introducing a new, more affordable e-cargo bike called the CAPACITA. Though why the name has to be in all caps is beyond me. It features front and rear cargo racks, with disk brakes, full fenders and capable of 40-miles on a single charge. Not to mention it’s GPS enabled, and has built-in headlights and taillights. And if you move fast enough, you can reserve one on their crowdfunding page for just $1399 — a 44% discount of the standard price of $2499. I’ve been thinking about getting rid of my two-decade old car and replacing it with a ped-assist cargo bike, though the high price of most ebikes has given me pause. But if I could get that much for my car, I’d give this one serious consideration. A reporter for KPCC discusses LA’s problems implementing Vision Zero with a Chicago radio station. Definitely worth a listen, even if it’s not a pretty picture. The LA Times goes for a ride along one of the possible routes NBA superstar LeBron James could take to get from his Brentwood home to the Staples Center. And it’s not a pretty picture, either. Personally, I’d take one of the two routes recommended by the LACBC’s Colin Bogart, which follows the route I used to ride from Westwood to DTLA with a few minor deviations. Metro is hinting at good news, saying they’ll announce a fare makeover for the Metro Bike bikeshare system this Thursday. On the other hand, Pasadena is planning to pull out of the Metro Bike system in the face of low ridership and mounting losses. The question is why would Pasadena continue to pump funds into a money-losing docked system, when dockless bikeshare can serve the same purpose at no cost to the city — and actually raise revenue through taxes and fees. Calbike’s annual California Dream Ride between Santa Barbara and San Diego is nearly sold out, with just five spaces left as of yesterday. Streetsblog considers the relative slap on the wrist given the Marin driver who fled the scene after running down four bike riders — allegedly on purpose. 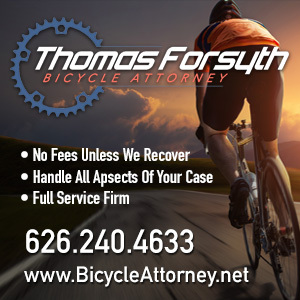 The president of the Lake Tahoe Bicycle Coalition offers advice for drivers and bike riders on how to stay safe on the roads. Although as usual, the first advice for riders is to wear a helmet and hi-viz. A writer for Outside says enough with the ghost bikes, it’s time to get organized. Great story about a Washington state fifth grader preparing for his sixth century ride — despite surviving hearing loss and a hit-and-run. At least one Utah town gets the concept that outdoor recreation offers a better long-term survival strategy than destroying the natural beauty to pull minerals out of the ground. A Des Moines IA couple gets their stolen bikes back thanks to social media and an observant pair of bike riders. Although someone should tell the local police that cable locks are just an invitation to steal. An Arkansas bike rider complains about the lack of bike path courtesy, particularly faster riders who can’t be bothered to announce their presence before zooming past. Chinese dockless bikeshare company Ofo has pulled out of Chicago, after licensing restrictions limit them to just 50 bikes in a 20 square mile area, or 350 if they require them to be locked to bike racks when not in use. Sometimes it seems pretty obvious that licensing terms are more about keeping dockless bikeshare out, as opposed to finding a way to work with it. The bikeshare system in Minneapolis is changing its colors, dropping its prices and losing the docks. After surviving a hit-and-run, a retired physician in Chattanooga says any talk about the city’s bicycle friendly status is just bull droppings. The A Plus website considers why Boston bike riders bare all in the World Naked Bike Ride. Tennis star Raphael Nadal is one of us, even if the US Open can’t seem to grasp that some people would rather bike than drive. British bike advocates complain about the missed opportunity when the country fails to offer subsidies to buy electric bikes as part of the country’s plan to eliminate vehicle emissions. Which is exactly the problem we have in California, since drivers can receive both federal and state subsidies for buying an electric car, but get nothing for trading a car for a bike, electric or otherwise. The driver who ran down British Olympic hero Chris Boardman’s mother in Wales was on his mobile phone moments before the crash. Lime takes on the City of Lights, teaching Paris how to scoot. Copenhagenize’s Mikael Colville-Andersen is taking heavy fire on Twitter over his comment that ebikes are an example of “white privilege” for “the laziest demographic in history.” Never mind that they allow virtually anyone to ride a bike, regardless of physical condition. Whatever problems we have, be grateful you don’t ride in Western Australia, where a new survey says bicyclists should be forced to ride single file and banned from narrow streets. And half of respondents say bike shouldn’t be allowed on the roads at all. Singapore is attempting to reign in dockless bikeshare with a new licensing program; three companies have pulled out of the city as a result, including Ofo. VeloNews reports on the team time trial in stage three of the Tour de France. American Lawson Craddock says he intends to fight like hell to stay in the Tour — despite a broken scapula that will be put to the test if he makes it to the cobbles on the ninth stage. CiclaValley considers the fashion side of the Tour de France. Researchers from Canada’s Simon Frasier University have developed a new statistical-based method of spotting dopers. Videos of the Tour of Flanders dating back to the 1980s are providing insights into the effects of climate change. An Australian woman has been charged in the alleged distracted driving death of 23-year old pro cyclist Jason Lowndes last December. Now you, too, can dress like the Cannibal. Your next bike could have a drive shaft instead of a chain — although that rear cassette looks deadly. And we may have to deal with angry drivers, but at least we hardly ever have to deal with stampeding police horses.